Our thoughts are with you Azealia! Azealia Banks has revealed that she has had a miscarriage. The rapper broke the news to her fans on Facebook today (Tuesday 20th December) in an emotional series of posts. 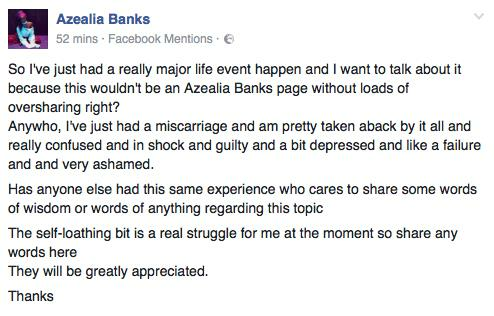 "So I've just had a really major life event happen and I want to talk about it because this wouldn't be an Azealia Banks page without loads of oversharing right?" she began. "Anywho, I've just had a miscarriage and am pretty taken aback by it all and really confused and in shock and guilty and a bit depressed and like a failure and and very ashamed. "Has anyone else had this same experience who cares to share some words of wisdom or words of anything regarding this topic. "The self-loathing bit is a real struggle for me at the moment so share any words here. They will be greatly appreciated." She continued: "I feel really stupid because I think I'm so big and bad an in control and In this situation I'm so powerless and when I first saw the embryo I felt this full spirit around me and was looking down at this little bean in horror/amazement and now I just can't NOT have an awareness of this person and wont stop feeling like any and everything I've ever done in my life or want to do is pointless." "I'm really over it and not with the sh*ts right now." Azealia wrote that she hopes her revelation will spark discussion among women.